Avocado Booking is excited to announce the first summer Open Air edition of it’s Imperial Never say Die! Tour. The tour, traditionally taking place in October / November of each year, will see it’s first open air edition this summer. The show will take place in Trier, Germany @ Exhaus on June 12th 2011. 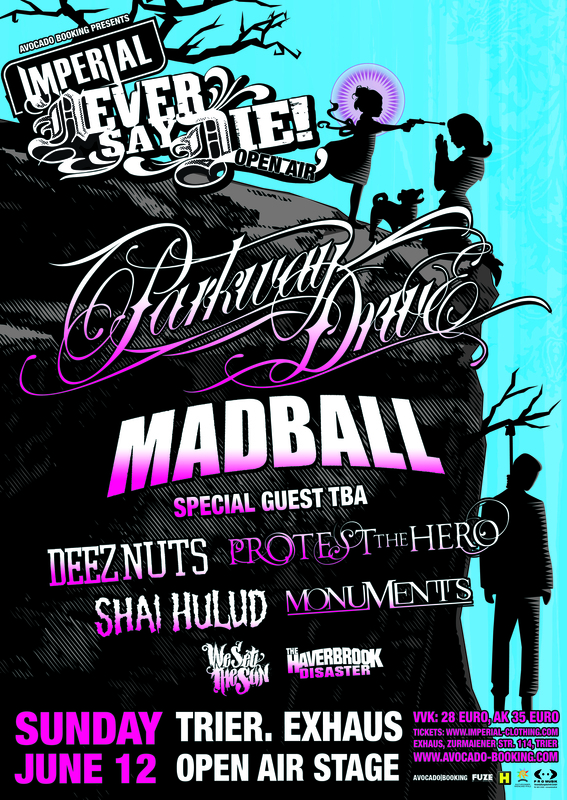 The line-up for the Open Air edition will be: Parkway Drive , Madball, A Special Guest, Deez Nuts, Protest The Hero, Shai Hulud, Monuments, We Set The Sun and The Haverbrook Disaster. Tags: Avocado, Avocado Booking, Deez Nuts, Exhaus, Germany, Madball, Monuments, Never Say Die, Never Say Die! Open Air, Never Say Die! Tour, Open Air, Parkway Drive, Protest The Hero, Shai Hulud, Show, The Haverbrook Disaster, Tours, Trier, We Set The Sun. Bookmark the permalink.